Imagine a computerized exercise machine that uses a micro to "maximize" your weight-training workouts? Some athletic coaches have been labeled cold, heartless and unfeeling. 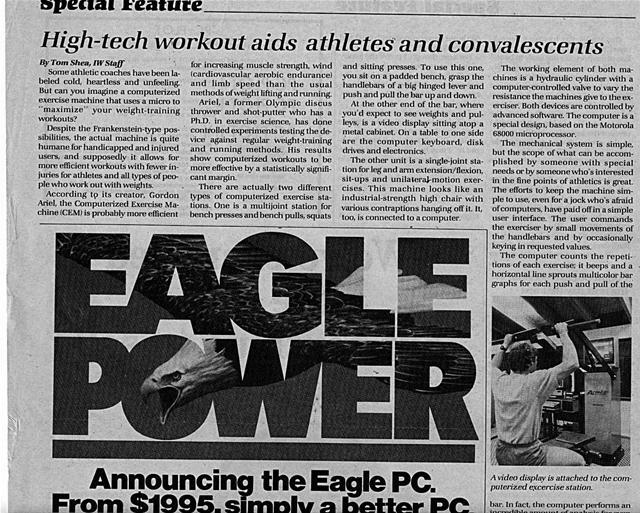 But can you imagine a computerized exercise machine that uses a micro to "maximize" your weight-training workouts? Despite the Frankenstein-type possibilities, the actual machine is quite humane for handicapped and injured users, and supposedly it allows for more efficient workouts with fewer injuries for athletes and all types of people who work out with weights. for increasing muscle strength, wind (cardiovascular aerobic endurance) and limb speed than the usual methods of weight lifting and running. Ariel, a former Olympic discus thrower and shot-putter who has a Ph.D. in exercise science, has done controlled experiments testing the device against regular weight-training and running methods. 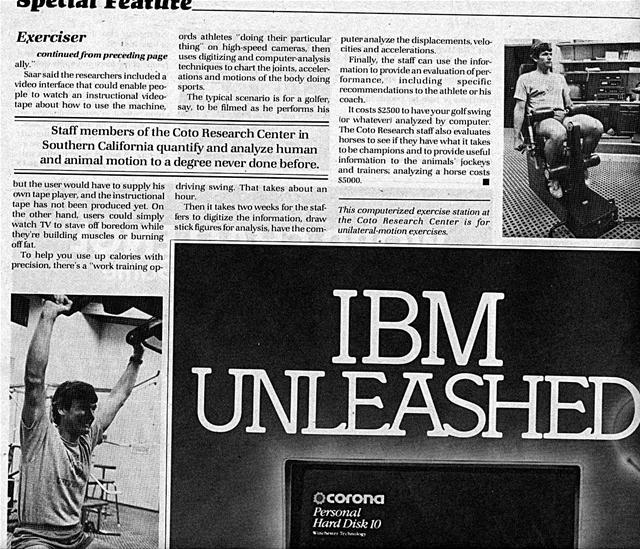 His results show computerized workouts to be more effective by a statistically significant margin. and sitting presses. To use this one, you sit on a padded bench, grasp the handlebars of a big hinged lever and push and pull the bar up and down. At the other end of the bar, where you'd expect to see weights and pulleys, is a video display sitting atop a metal cabinet. On a table to one side are the computer keyboard, disk drives and electronics. The other unit is a single-joint station for leg and arm extension/flexion, sit-ups and unilaterajr-motion exercises. This machine looks like an industrial-strength high chair with various contraptions hanging off it. It, too, is connected to a computer. The working element of both ma-, chines is a hydraulic cylinder with a computer-controlled valve to vary the resistance the machines give to the exerciser. Both devices are controlled by advanced software. The computer is a special design, based on the Motorola 68000 microprocessor. The mechanical system is simple, but the scope of what can be accomplished by someone with special needs or by someone who's interested in the fine points of athletics is great. The efforts to keep the machine simple to use, even for a jock who's afraid of computers, have paid off in a simple user interface. The user commands the exerciser by small movements of the handlebars and by occasionally keying in requested values. A video display is attached to the coinputerized ercercise station. From $1995, simply a better PC. Eagle clears the air on what it takes to buy a computer. Announcing the Eagle PC. 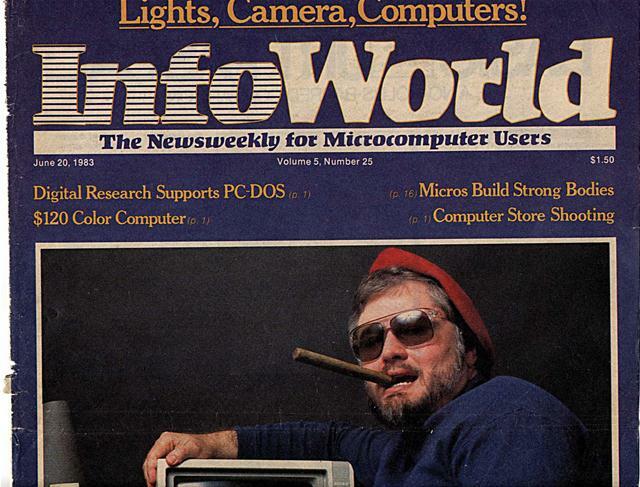 This compact, economical computer gives you a headstart with its 16-bit microprocessor. User friendliness to a degree which may only be termed: simplicity with elegance. Just plug it in, flip the switch, and go to work. The Eagle PC is compatible with hardware and software for the IBM personal computer, offering you a host of hardware extras, and your choice of programs from a large library of MS-DOS business and personal application software. Save time without losing space. Silent, compact and modular, the Eagle PC is small enough to fit on a credenza. Its handsomely sculpted keyboard designed for word processing and financial planning conveniently stores inside the processor enclosure when not in use to save space. Eagle productivity organizes your business. The Eagle PC is available at a base system price of $1995. Complete, turnkey systems for urider $3000 include operating systems, word processing, and financial planning software at no additional charge. For those needing greater disk storage, the Eagle PC-XL, with 10 megabytes of hard disk storage, starts at $4495. High resolution graphics are standard. expandable, so you can add memory, additional disk storage, peripherals, and other options to build a system that will expand with your needs. 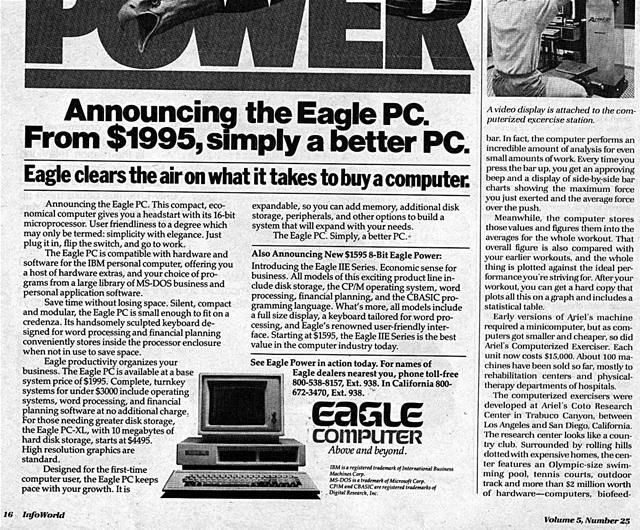 Also Announcing New $1595 8-Bit Eagle Power. Introducing the Eagle HE Series. Economic sense for business. All models of this exciting product line include disk storage, the CP/M operating system, word processing, financial planning, and the CBASIC programming language. What's more, all models include a full size display, a keyboard tailored for word processing, and Eagle's renowned user-friendly interface. Starting at $1595, the Eagle HE Series is the best value in the computer industry today. Eagle dealers nearest you, phone toll-free 800-538-8157, Ext. 938. In California 800672-3470, Ext. 938. IBM is a registered trademark of International Business Machines Corp.
MS-DOS is a trademark of Microsoft Corp. CP/M and CBASIC are registered trademarks of Digital Research, Inc.
A video display is attached to the computerized excercise station. bar. In fact, the computer performs an incredible amount of analysis for even small amounts of work. Every timeyou press the bar tip, you get an approving beep and a display of side-by-side bar charts showing the maximum force you just exerted and the average force over the push. Meanwhile, the computer stores those values and figures them into the averages for the whole workout. That overall figure is also compared with your earlier workouts, and the whole thing is plotted against the ideal performanceyou'r a striving for. Afteryour workout, you can get a hard copy that plots all this on a graph and includes a statistical table. 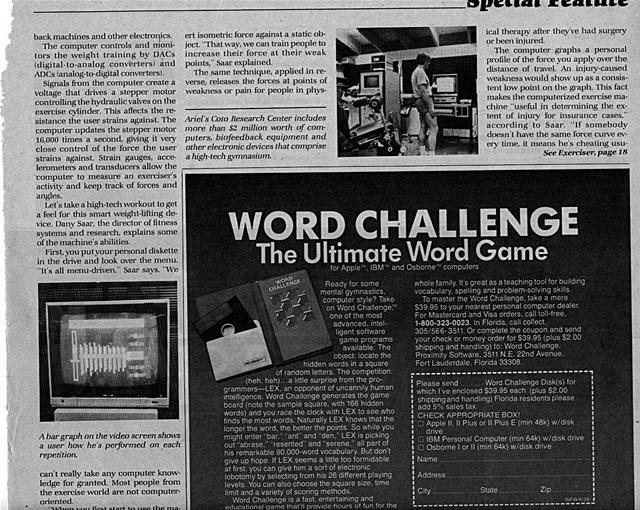 Early versions of Ajiel's machine required a minicomputer, but as computers got smaller and cheaper, so did Ariel's Computerized Exerciser. Each unit now costs $15,000. About 100 machines have been sold so far, mostly to rehabilitation centers and physicaltherapy departments of hospitals. back machines and other electronics. The computer controls and monitors the weight training by DACs (digital-to-analog converters) and ADCs (analog-to-digital converters). Signals from the computer create a voltage that drives a stepper motor controlling the hydraulic valves on the exercise cylinder. This affects the resistance the user strains against. The computer updates the stepper motor 16,000 times a second, giving it very close control of the force the user strains against. Strain gauges, accelerometers and transducers allow the computer to measure an exerciser's activity and keel) track of forces and angles. Let's take a high-tech workout to get a feel for this smart weight-lifting device. Danv Saar, the director of fitness systems and research, explains some of the machine's abilities. ert isometric force against a static object. "That way, we can train people to increase their force at their weak points," Saar explained. Ariel's Coto Research Center includes more than $2 million worth of computers, biofeedback equipment and other electronic devices that comprise a high-tech gymnasium. ical therapy after they've had surgery or been injured. mental gymnastics. , '	vocabulary, spelling and problem-sorting skills. 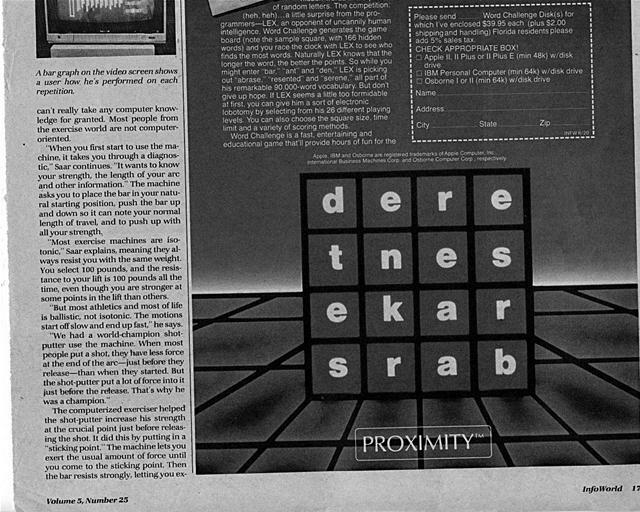 'ion; Word Challenge:" . $39.95 to your nearest personal computer dealer. ,,.one of the-most .	. For Mastercard and Visa orders, call- toll-free. y available. The	shipping and handling) to: Word Challenge. dden words )n a square	Fort Lauderdale, Florida 33308..
A bar graph on the video screen shows a user howw he's performed on each repetition. A bar graph on the video screen shows a user how he's performed on each repetition. can't really take any computer knowledge for granted. Most people from the exercise world are not computeroriented. "When you first start to use the machine, it takes you through a diagnostic," Saar continues. "it wants to know your strength, the length of your arc and other information." The machine asksyou to place the bar in your natural starting position, push the bar up and down so it can note your normal length of travel, and to push up with all your strength. "Most exercise machines are isotonic," Saar explains, meaning they always resist you with the same weight. You select 100 pounds, and the resistance to your lift is 100 pounds all the time, even though you are stronger at some points in the lift than others. "But most athletics and most of life is ballistic, not isotonic. The motions start off slow and end up fast," he says. "We had a world-champion shotputter use the machine. "'hen most people put a shot, they have less force at the end of the arc-just before they release-than when they started. But the shot-putter put a lot of force into it just before the release. That's why he was a champion." board note the sam le uare with 166 hidden	shipping and handling) Florida residents please. p	t add 6% sates tax. puleranalvze the displacements, velocities and accelerations. Finally, the staff can use the information to provide an evaluation of performance, including specific recommendations to the athlete or his coach. own tape player, and the instructional hour. or ds athletes "doing their particular thing" on high-speed cameras, then uses digitizing and computer-analysis techniques to chart the joints, accelerations and motions of the body doing sports. and animal motion to a degree never done before. Dany Saar, director of fitness systems and research, finds his "sticking point," the point in the arc of travel at which the computer-controlled machine.stronglvresists his upward push. tion" that lets you set yourself so much work to do. You can specify the amount of work in all sorts of measures: calories, ergs, foot-pounds. After you've chosen the amount of work, you can do it at any rate you want. The machine counts it down until you're done. Another option tells the machine to stop your routine when you've reached a certain fatigue level. The Ariel Computerized Exercise Machine is the latest version of a product that has been a long time coming. It came out of Ariel's work in biomechanics and his determination to "take the witchcraft out of coaching" originally and later to do the same thing with weight training. Now you can move your IBM PC' from the fast lane into the jet stream. With the Personal Hard Disk' from Corona. 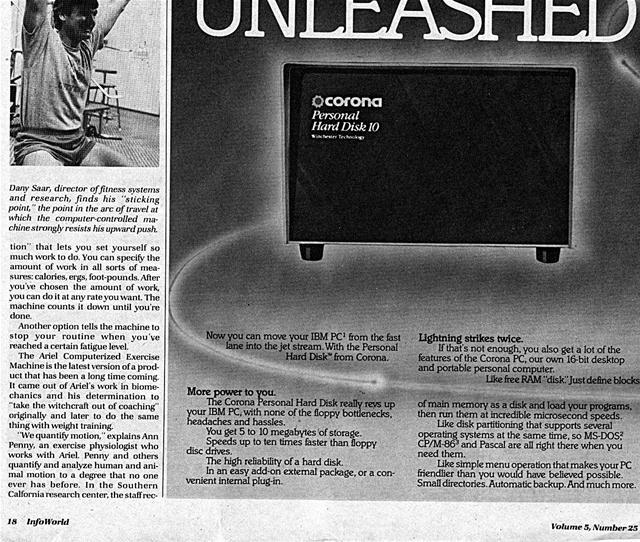 The Corona Personal Hard Disk really revs up your IBM PC, with none of the floppy bottlenecks. headaches and hassles. You get 5 to 10 megabytes of storage. Speeds up to ten times faster than floppy disc drives. The high reliability of a hard disk. In an easy add-on external package, or a convenient internal plug-in. If that's not enough, you also get a lot of the features of the Corona PC, our own 16-bit desktop and portable personal computer. of main memory as a disk and load your programs, then run them at incredible microsecond speeds. Like disk partitioning that supports several operating systems at the same time, so MS-DOS? CP/M-863 and Pascal are all right there when you need them. Like simple menu operation that makes your PC friendlier than you would have believed possible. Small directories. Automatic backup. And much more. Generated on 4/20/2019 3:22:25 PM (PST) ADI/HQ/GBA/2019/ARIELCLOUD/v3.0.2018.0126.